This year has been good for food-tech in India. In December, food-delivery startup Swiggy raised $1 billion in fresh capital from Naspers Ltd and Tencent Holdings Ltd, marking what is by far the biggest ever funding round in India’s food-tech sector. 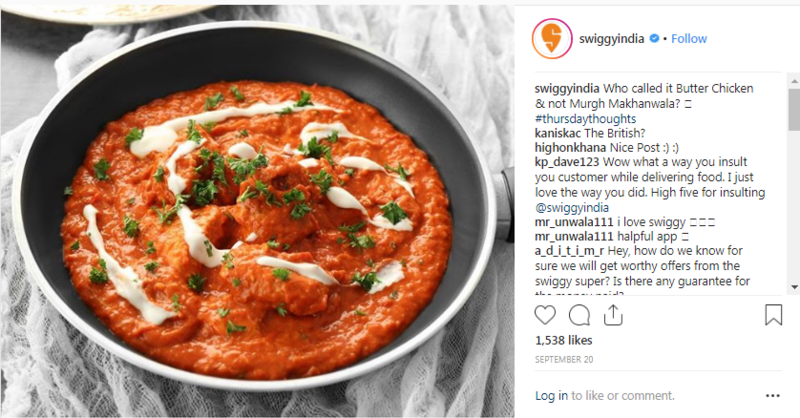 To understand how Swiggy is using social media to engage the audience, we thought of decoding its Instagram content. 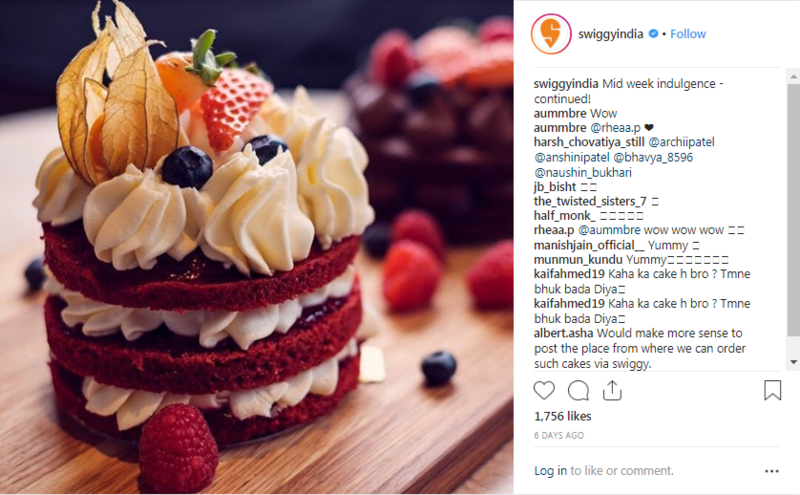 We analyzed Swiggy’s last six-months Instagram posts. And here’s what we learned. But before we dive in, let’s take a look at Swiggy’s top ten most engaging posts. 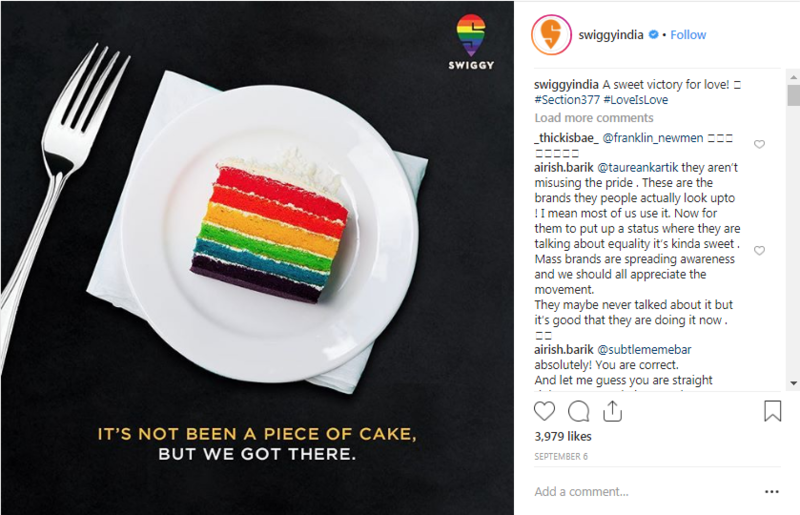 Back in September when the Supreme court of India passed the historic judgment of decriminalizing section 377 many brands, celebrities came forward in its support on social media. Swiggy too took pride in celebrating the judgment with the following post. This post received 4,122 engagements. 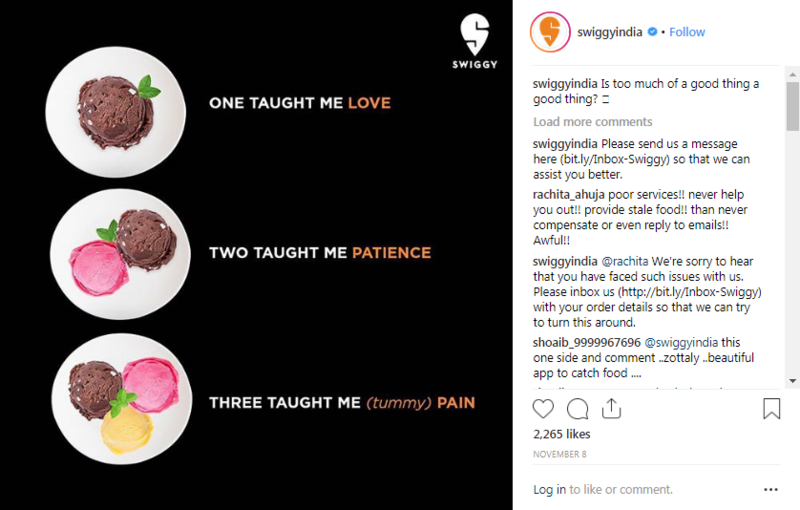 The second most engaging post of Swiggy is an extension of responsible brand messaging. This video puts across the message to follow traffic rules, to stay safe for yourself, and your family. However, cleverly, Swiggy rolled down the message that whatever is the situation, their delivery partners always delivers on time. This video received 2,278 likes and 120 comments. Swiggy already has an advantage: food. They can use food to convey numerous emotions. 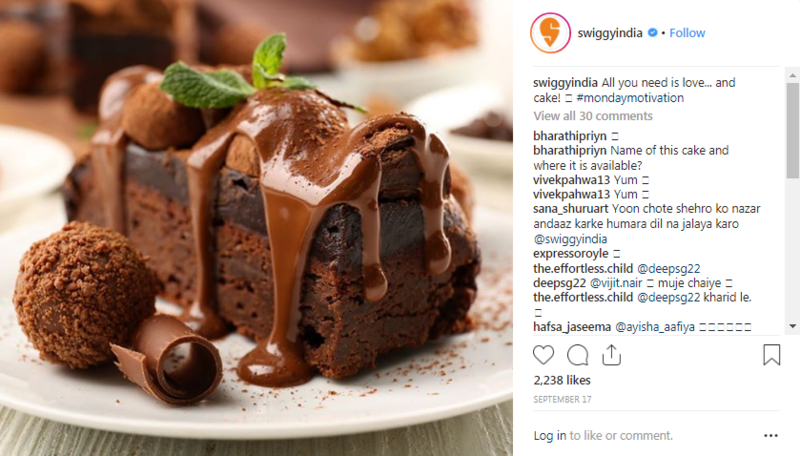 It is amazing how Swiggy used analogy in this Instagram posts. It’s simple. Creative. And awesome. Every sweet tooth (if not everyone) in the world can relate to this post in an instant. No wonder this post received 2,265 likes! The fourth most engaging post focused on what we all hate–MONDAYS! And here’s how Swiggy brightened up the Monday with a piece of cake. See that MondayMotivation hashtag? This inviting cake received 2273 engagements. On a Monday! 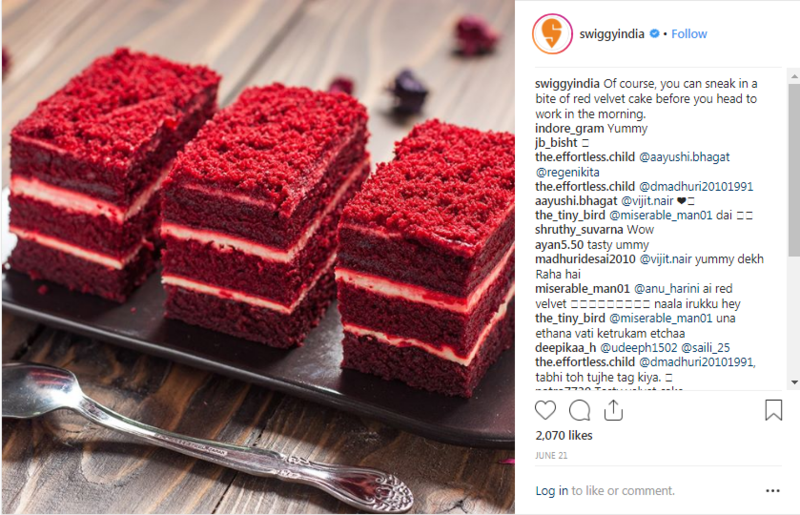 The fifth most engaging post of Swiggy again ticks all the boxes with perfect creative copy combination. This post will make you dream about that red velvet cake throughout the day at work and you might just end up ordering some! This post received 2070 total likes. 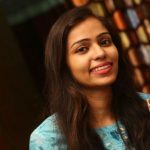 What I personally like about this post, as you relate it from the other, Swiggy has something new to say to their audience every day of the week. Targeting the emotion every working professional might be feeling sitting in her office: mid-week blues. So much for the work-life. This mid-week indulgence post received 1769 total likes. I think the copy says it all for the seventh most engaging post: “How about a delectable dessert to lift up spirits?” Who would not like that post with this image and caption? You can also notice in the post comments that people are asking from where they can actually order this cake. Seems like Swiggy is not replying. But another great opportunity for Swiggy to build new customers. Delectable dessert. Hence, 1,641 likes. Once again killing it with this mouth-watering shot of a plate of quesadillas along with beating the mid-week blues inspiration. This post received 1647 total engagement. 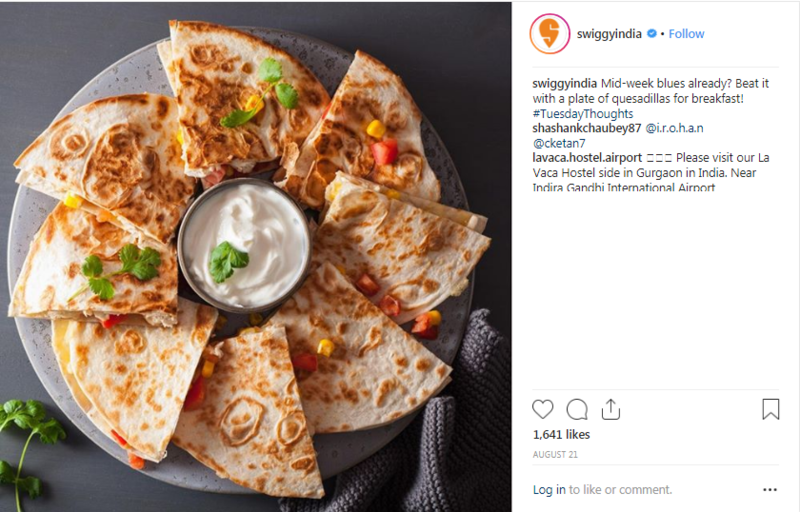 The next most engaging post is this user-generated content shared by Swiggy. Since user generated content isn’t paid for, its authenticity makes a connection between the brand and its users. This post attracted 1598 total engagement. It had to be this. It had to be. Even on a Thursday. The butter chicken feature received 1560 total engagements. Use responsible brand messaging: Promote causes that generate meaningful impact on the society. Inspire your audience. 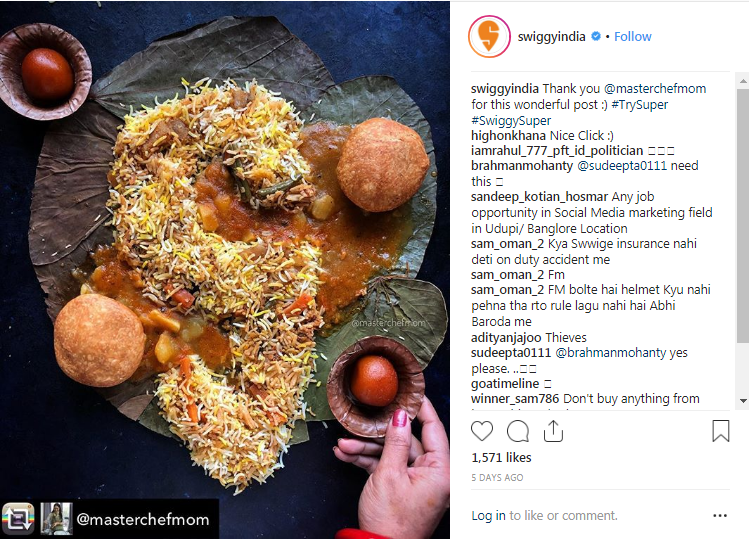 Top two posts were related to social messages rather than Swiggy’s actual offering: food delivery. Post content that resonates with the audience: Find out ways, topics that make a connection with your audience. Add a pinch of humor and sarcasm to your content. If you don’t know how to find the best content or themes, try these content marketing tools. Swiggy understands that a large chunk of its audience comes from the millenials. Posts focused on #MondayMotivation and Mid-week indulgence tells a lot about their marketing communication. Sharing user-generated content: You cannot create all types of content at all the time. Nor can you think in all the directions. So what do you do? Let your users do it. Plus, user generated content can create more organic engagement on Instagram: it’s authentic and you are tapping into the following of your audience. Sometimes one hashtag is enough: You don’t need to add tons of hashtag to increase your reach. Using too many hashtags does not increase engagement rather makes the caption look cluttered. Stick to 2-3 hashtags relevant to the posts. Check that #MondayMotivation post and it has just one hashtag. Just one! Do you want to see top posts from other companies too? Write down your suggestions in the comment below and we will get it on our blog for you.